kuchiroro were formed as a break beats unit in 1998 with Koshi Miura as the central figure. Their style has evolved toward pop through trial and error using various instruments such as turn tables and samplers. Their self-titled first album released on WEATHER/HEADZ in 2004 was well-received and selected as the best Japanese rock album of the year by MUSIC MAGAZINE. The following year their 2nd album, “FANFARE”, was released. 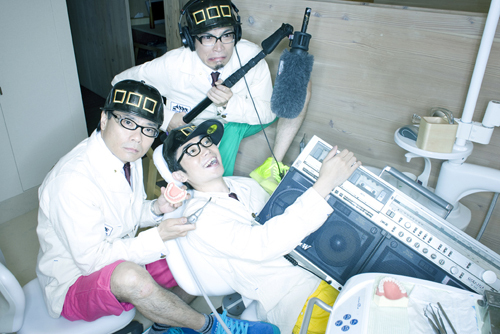 In 2006, they moved labels to commmons, and released their major debut single “GOLDEN KING”. The following year they continued exploring new ground, releasing the break beats musical “GOLDEN LOVE”, their 4th album which was again selected as the best rock album of the year by MUSIC MAGAZINE. In 2008 Shige Murata, a member of Cubismo Grafico Five, joined the group and they made a fresh start with the release of the single “snowflake”.